This morning we awoke to sunny blue skies. Upon stepping outside, we decided it was going to be another hot steamy day, the likes we've seen for the last couple of weeks now. With that we decided to go back inside for our usual cups of Joe, bowls of cereal, and air conditioning. In a bit we will get ready to start back on ripping out the bathroom in our hall as we are going to convert it to a nursery for our bundle of joy that is due to arrive this winter. I can only hope that in a few weeks time we will be close to finishing that up, the temperatures will start to cool a bit, and we can get out for a couple more hikes. In the meantime, while sitting here enjoying the coffee and having polished off what was left of the Crunch Berry cereal, I realized it was time to fire up the random number generator (RNG) as we have two prizes to give away. After doing it's thing twice the RNG has declared that we has winners. For the first prize: The GoGirl , our lucky winner, as designated by the RNG, is Family Wilds. Congratulations Pablo and Nea, may the GoGirl serve Nea well. 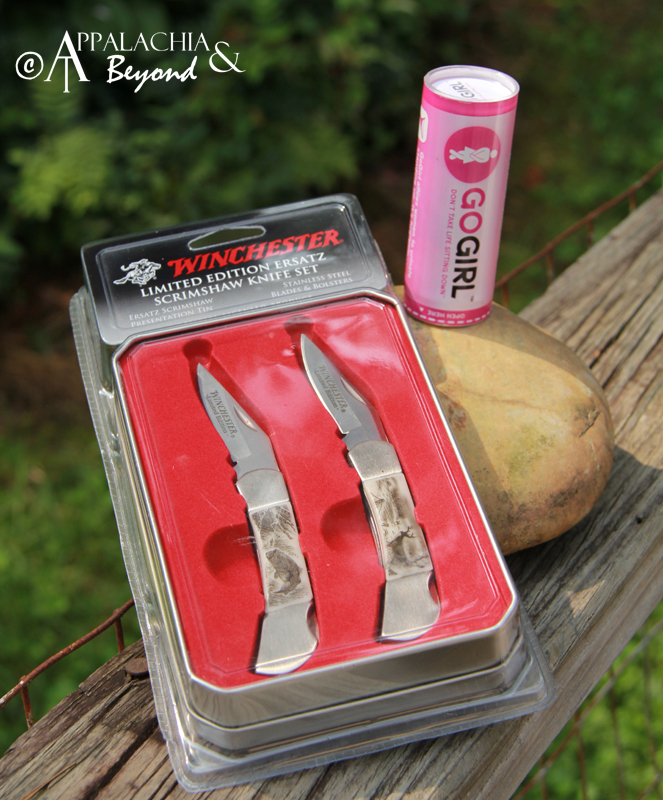 The second prize up for grabs was a pair of Winchester Limited Edition Ersatz Scrimshaw Knives . We had a few more entries for these than the GoGirl so the RNG had a few more numbers to crank through before declaring the winner. So without further ado, the lucky winner will now have to answer the question as to whether she, "should keep them to herself or share them with her hubby?" Congrats goes out to Brandy, the lucky winner of the knife set.